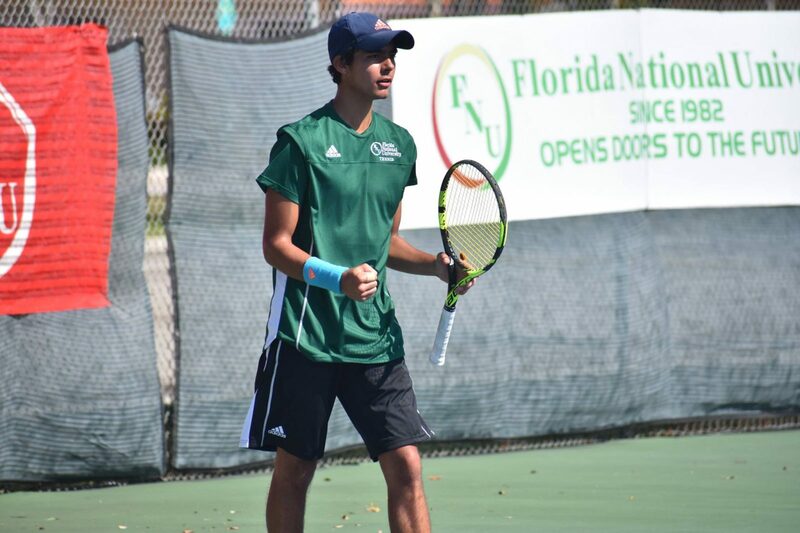 Hialeah, Fla. – Conquistadors men’s tennis start off losing the doubles 2-1 and Singles and 4-2 in Singles. Conquistadors women’s tennis got 0-8 loss in the second home game of the season. Joaquin Rodriguez and Geranimo Vivero (FNU) defeated Marcheschi & Martinez (SU) 9-8. Felipe Barbosa and Thomas Ortega (SU) defeated Franco Minoldo and Fabrizio Tormen (FNU) 8-3. Santiago Haas and Hugo Pires (SU) defeated Tim Oppermann and Franco Minoldo (FNU) 8-3. Felipe Barbosa (SU) defeated Joaquin Rodriguez (FNU) 3-0, Retired. Geronimo Vivero (FNU) defeated Santiago Haas (SU) 6-2, 6-4. Enrique Martinez (SU) defeated Franco Minoldo (FNU) 6-3, 6-2. Fabrizio Tormen (FNU) defeated Tyler Glowaki (WU) 6-4, 6-0. Tim Oppermann (FNU) defeated Henrique Dias (WU) 6-3, 6-2. SU’s Sharienne Ricardo and Beatrice Letizia took down FNU’s Sofia Pera and Candela Bonivardi in the first pairing of doubles by a score of 8-6. SU’s Angelique Myrtil and Gabby Marshall defeated Moana de Souza and Ana Barreto in the second doubles matchup 8-2. SU’s Priscila Baptista and Mia Dunagan finished things off in the third doubles slot defeating FNU’s Andrea Guzman & Nathalia Vivas 8-4. Sharienne Ricardo (SU) defeated Sofia Pera (FNU) 7-5, 2-6. Beatrice Letizia (SU) defeated Candela Bonivardi (FNU) 1-6, 6-4, 10-8. Angelique Myrtil (SU) defeated Moana de Souza (FNU) 6-1, 6-0. Gabby Marshall (SU) defeated Andrea Guzman (FNU) 6-1,6-2. Mia Dunagan (SU) defeated Nathalia Vivas (FNU) No.6 singles match was canceled due to weather. The Conquistadors will face Florida Institute of Technology on Saturday, February 9th, at Melbourne, Florida at 2:00 p.m.